February kicked off with another strike, protesting against austerity measures at several major Greek ports. Meanwhile, Southampton and Melbourne ports received approval for development projects and two European green shipping initiatives gathered momentum. Eidesvik's Viking Grace will be equipped with a lithium-ion battery package in spring 2013. Image courtesy of Eidesvik. The Port of Melbourne has received approval for its $1.64bn Webb Dock development. Image courtesy of Marcus Wong. APM Terminals will operate the in-development Aegean Gateway Terminal in Turkey for 28 years. Image courtesy of APM Terminals. Labour unrest continued in the European port industry in February, with the Greek Seamen’s Union launching a two-day strike at the beginning of the month. The strike, launched to protest against the government austerity policies that have cut into wages and increased taxes, forced vessels to stay docked at several major Greek ports. Operations were disrupted at the ports of Piraeus, Aspropyrgos, Eleusis and Lavrion. The Greek Government’s cuts are intended to help it pay back €8bn of its €9bn private sector debt by the end of 2013. But the austerity measures have proven extremely unpopular, with shipyards also affected by strikes – Elesfina Shipyard workers downed tools at the very end of January 2013, claiming they had been paid only part of their wages since 2010. Maritime industry efforts to reduce the environmental impact of shipping have continued apace in early 2013. In February, the Norwegian shipping industry announced a broad coalition to develop vessels powered by eco-friendly hybrid technology. Under the FellowSHIP II project, Eidesvik’s offshore supply vessel Viking Lady has already been equipped with a 330kW molten carbonate fuel cell, and the FellowSHIP III project will see a lithium-ion battery package installed on the ship in spring 2013, allowing for full hybrid operations by 2015. Hybrid energy technology could reduce ship fuel consumption and CO2 emissions by 20-30%. Norway’s maritime industry aims to build and launch four hybrid vessels by the end of 2014. With the recent establishment of Damen’s Shiprepair & Conversion division, the Dutch shipbuilding company is looking to expand its presence in the ship repair sector. To this end, Damen has acquired Dutch ship repair company Shipdock, which operates marine maintenance facilities in Amsterdam and Harlingen. Shipdock’s Amsterdam facilities can service vessels up to 250m long, while its Harlingen yard is suitable for maintaining vessels of up to 150m. The company also runs a machine shop and steel construction facility in Amsterdam. 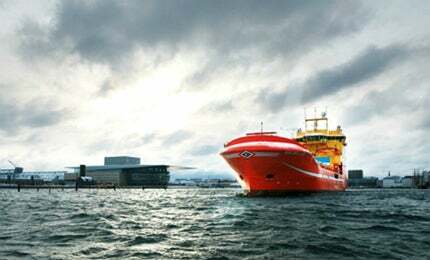 Shipdock’s personnel and management will remain in place and the company’s operations will continue as normal, until the company is folded into Damen’s business. Swiss power and automation firm ABB has also been expanding its business, in February acquiring US-based company APS Technology, which supplies vision-based automation systems for ports and intermodal container facilities. This acquisition is expected to complete by the end of Q1 2013, after which APS will be integrated into ABB’s process automation division. ABB’s backing will help APS expand into new geographical markets and improve the company’s support engineering capabilities, according to APS founder and CEO Russ Scheppmann. "Our customers will also benefit from ABB’s global reach in sales and service, and combined efforts in R&D projects," he said. Ship-based carbon capture and storage (CCS) is an incredibly complex undertaking that has been thought unachievable in the past. But a new project by Det Norske Veritas (DNV) and Process Systems Enterprise (PSE) intends to prove the technology is feasible for ships, with emissions reduction of up to 65%. The companies have collaborated on a concept design for onboard maritime chemical CO2 capture, which was unveiled in February. The concept involves the use of chemical absorption to separate CO2 from flue gases, before compressing it in a liquefaction unit and stored in two tanks, ready for discharge into a port-based storage facility. DNV said the CCS system could reduce emissions from a very large crude carrier by more than 70,000 tonnes per year (tpy), potentially turning ship emissions into a tradable product. The UK’s Associated British Ports (ABP) is aiming to keep up with the demands of the international shipping market with a plan to deepen and widen its shipping channel to improve access to the Port of Southampton. The project, which has now been approved by the Marine Management Organisation, will see around 23 million tonnes of material removed from the main navigational channel to allow access for larger ships and, in some places, allowing ships to pass side by side. ABP has already received approval to expand the port’s access channel by 30m and has started work on a new container berth. The company hopes its expansion projects will ensure a healthy future for the Port of Southampton and the 12,000 jobs it supports. APM Terminals is set to establish a long-term foothold in the Turkish market after signing a deal with Petkim Petrokimya that will see APM build and operate a new container and cargo terminal near Izmir on the country’s Aegean coast. The Aegean Gateway Terminal’s (AGT) construction is being funded with $400m from Petkim, with the project’s first phase expected to start operations in summer 2014. APM will operate the terminal for at least 28 years. AGT’s initial annual container capacity will be 1.5 million teu, which could be doubled if there is demand. The terminal will have a first-phase quay length of 350m, and the second phase will increase the quay to 700m by 2016. The Port of Melbourne Corporation (PoMC) has received approval from the state government of Victoria, Australia, to start work on its $1.64bn Webb Dock development project in Melbourne. The project incorporates the general redevelopment of the port’s operational areas, as well as the construction of a container terminal at Webb Dock and a new 920m wharf for the port’s automotive trade, which will be consolidated into a new facility at Webb Dock West. Victoria Minister for Planning Matthew Guy said there will be new benchmarks of environmental standards and accountability, to make sure the local bay, waterways and wildlife are protected during the project. Noise walls will also be built to reduce the impact of port operations on surrounding residential neighbourhoods. January brought major orders for cruise vessels, wind farm support ships and container vessels, while ports in the UAE and UK reported progress on expansion projects.